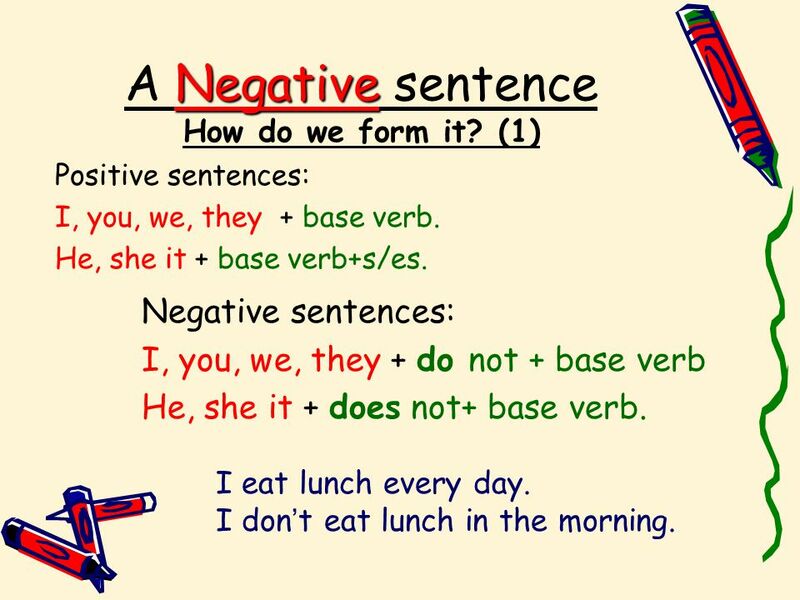 Present Simple Negative What? When? How? Revision. 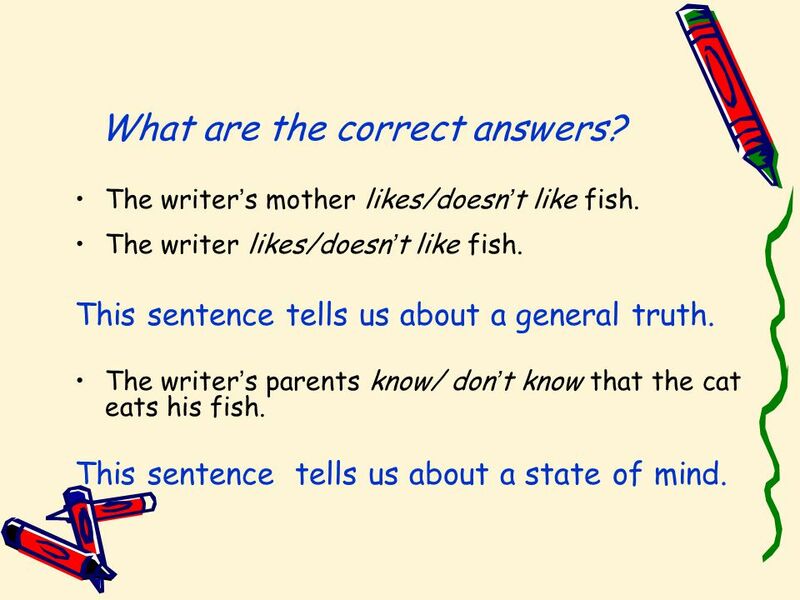 3 What are the correct answers? The writer ’ s mother likes/doesn ’ t like fish. The writer likes/doesn ’ t like fish. This sentence tells us about a general truth. 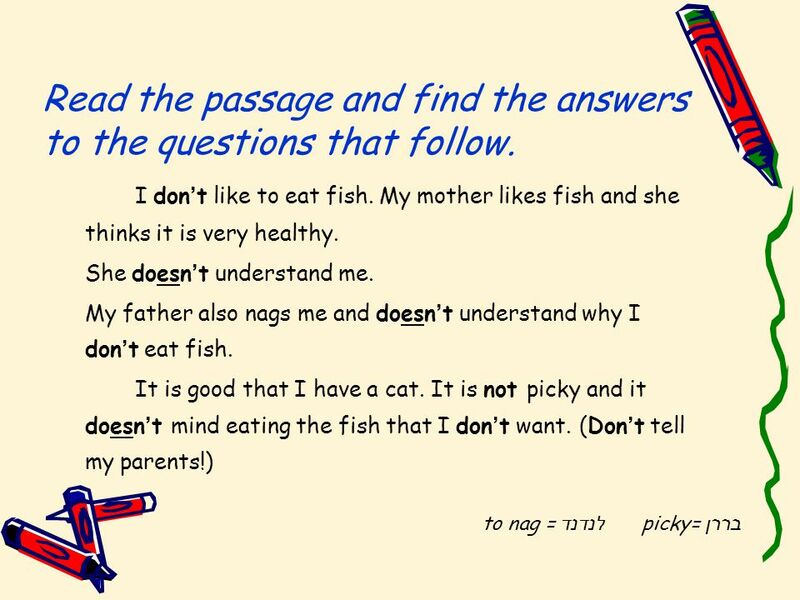 The writer ’ s parents know/ don ’ t know that the cat eats his fish. This sentence tells us about a state of mind. 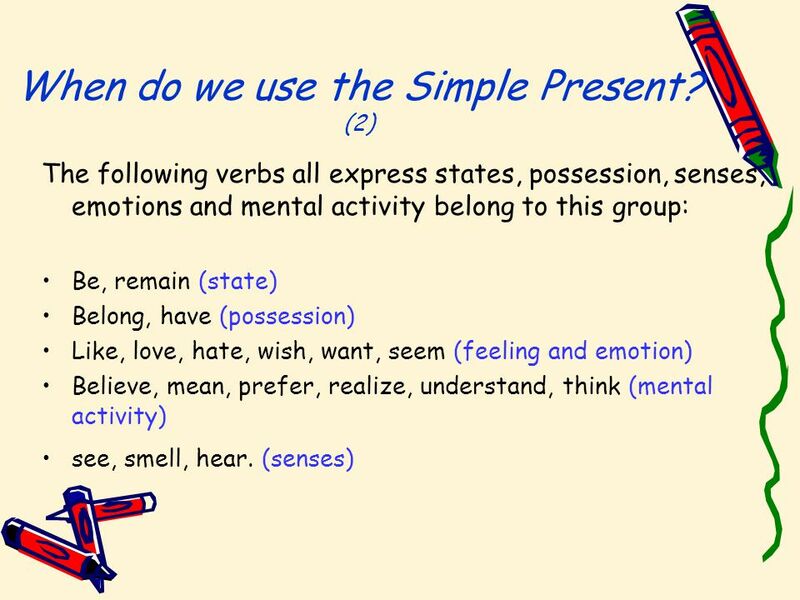 4 When do we use the Simple Present? (1) When we speak about general truths or facts. When we speak about habits or customs. When we speak about feelings and senses. Expressing senses, emotions and mental activity When we speak about states and possession. When we speak about states of mind or being. 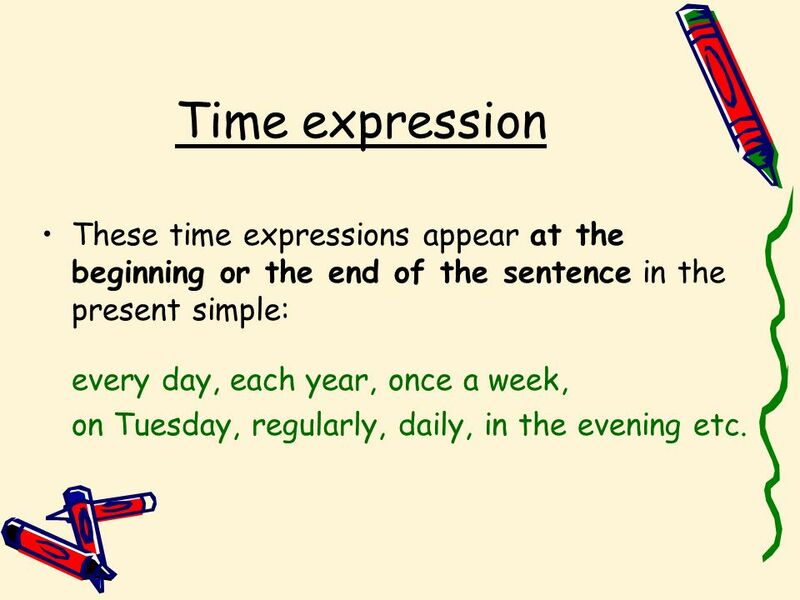 7 Time expression These time expressions appear at the beginning or the end of the sentence in the present simple: every day, each year, once a week, on Tuesday, regularly, daily, in the evening etc. 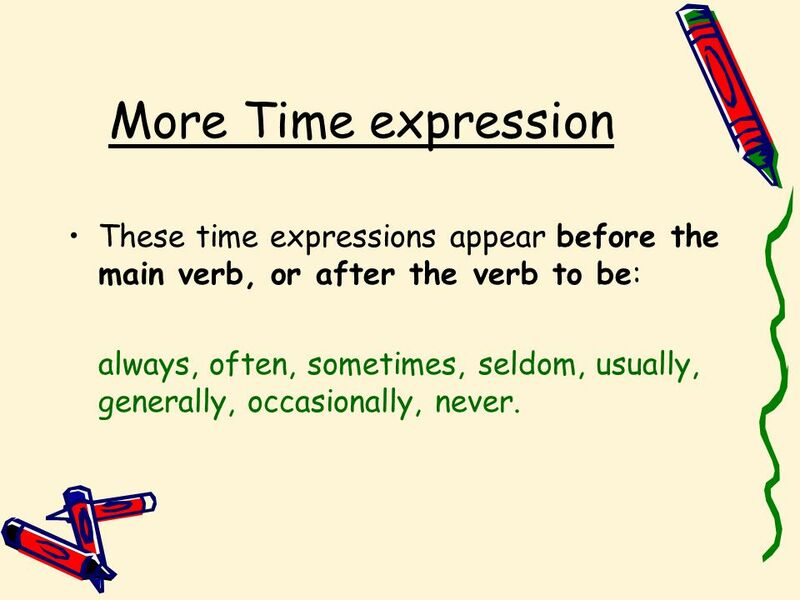 8 More Time expression These time expressions appear before the main verb, or after the verb to be: always, often, sometimes, seldom, usually, generally, occasionally, never. 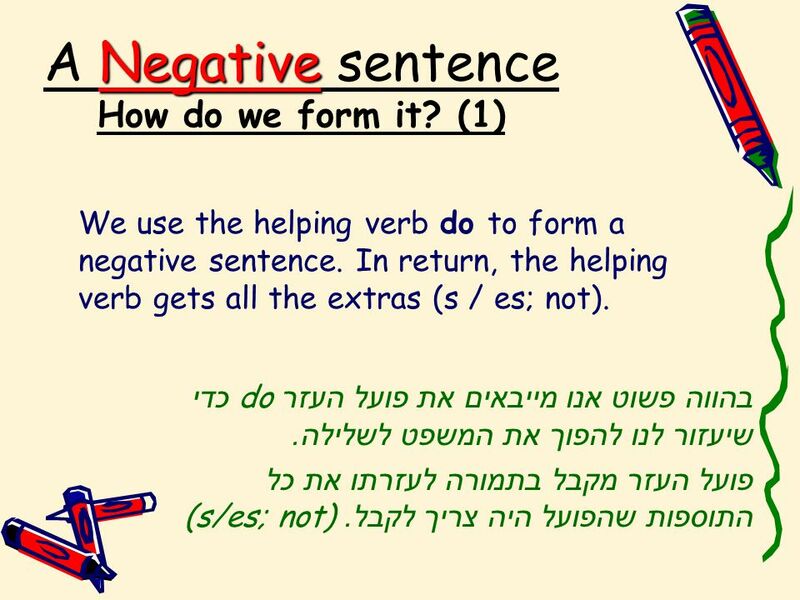 10 Negative A Negative sentence How do we form it? 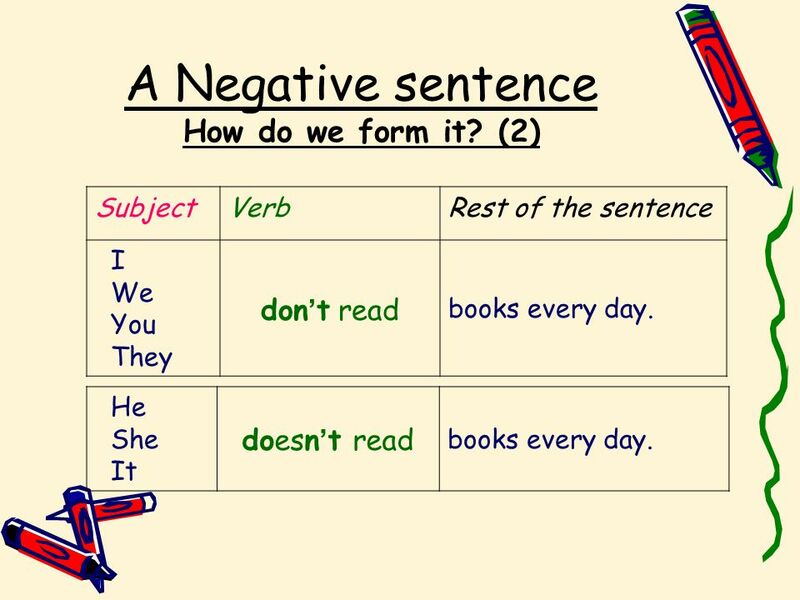 (1) Positive sentences: I, you, we, they + base verb. He, she it + base verb+s/es. I eat lunch every day. I don ’ t eat lunch in the morning. 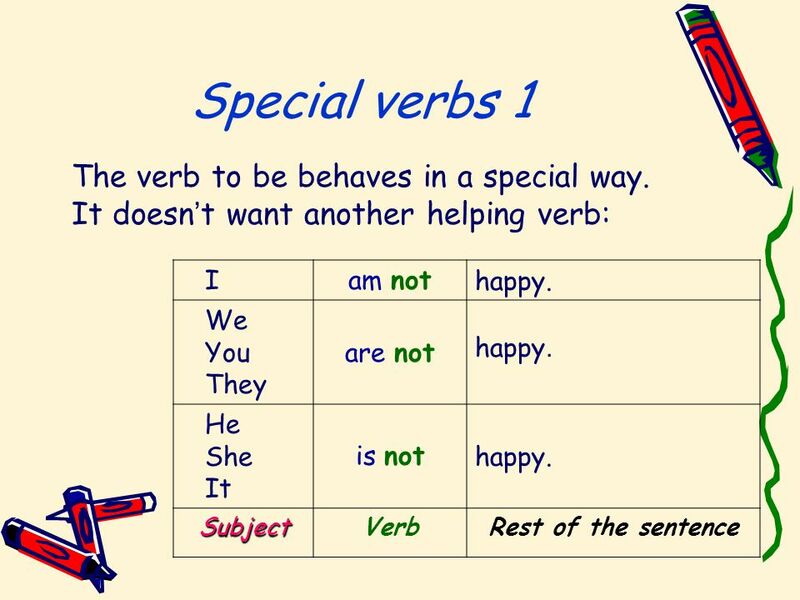 Negative sentences: I, you, we, they + do not + base verb He, she it + does not+ base verb. 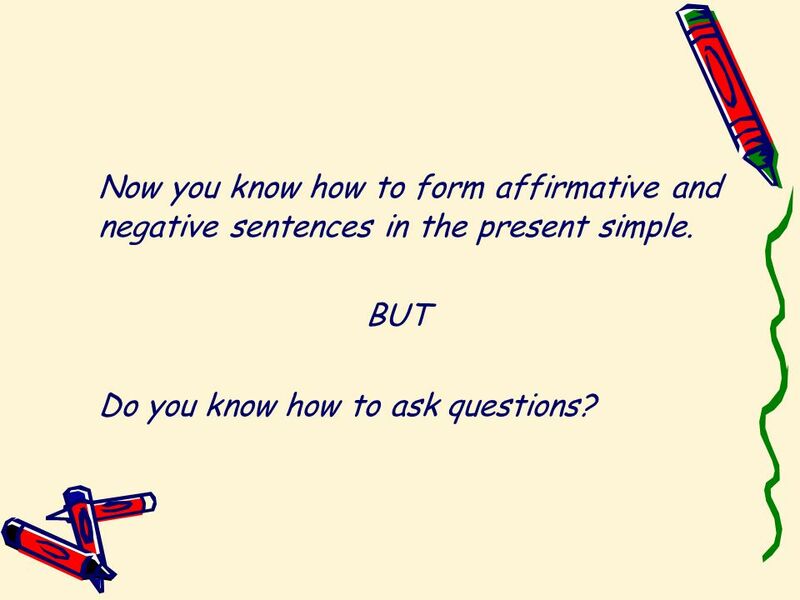 16 Now you know how to form affirmative and negative sentences in the present simple. BUT Do you know how to ask questions? 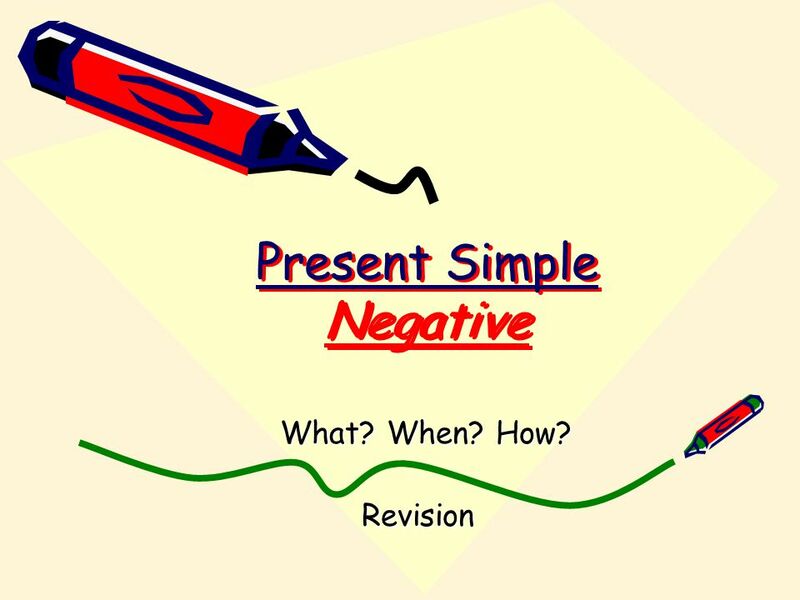 Download ppt "Present Simple Negative What? When? How? Revision." 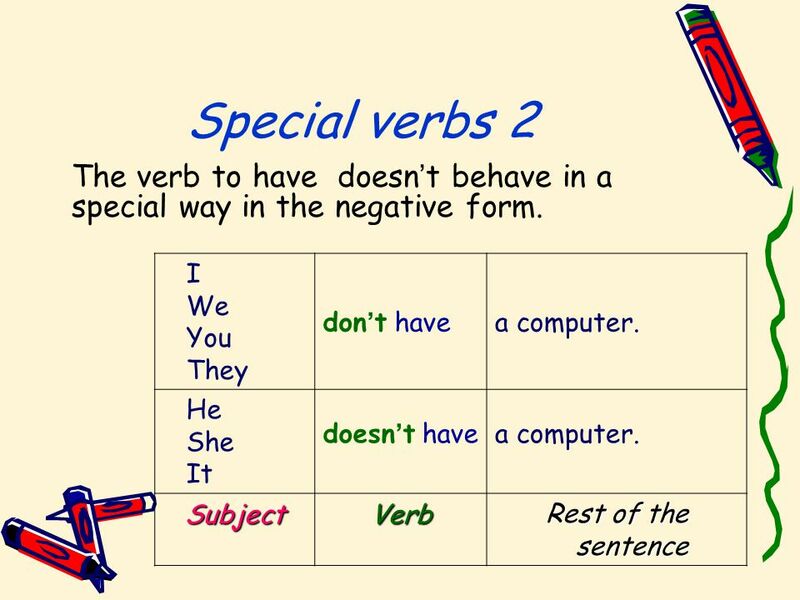 Simple present The simple present expresses an action in the present taking place once, never or several times. It is also used for actions that take place. 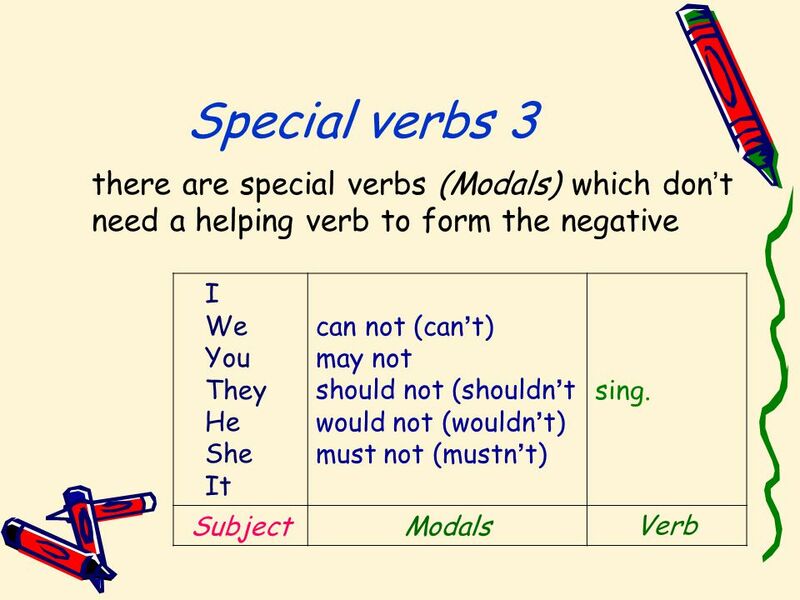 STATE AND ACTIVITY VERBS. Now, I know the answer.  What’s the tense?  When is it happening? GRAMMAR Present Simple Present Continuous. Present Simple I work don’t work do you work? You work We work They work He/ she / it works doesn’t work Does. The present Simple and present progressive... 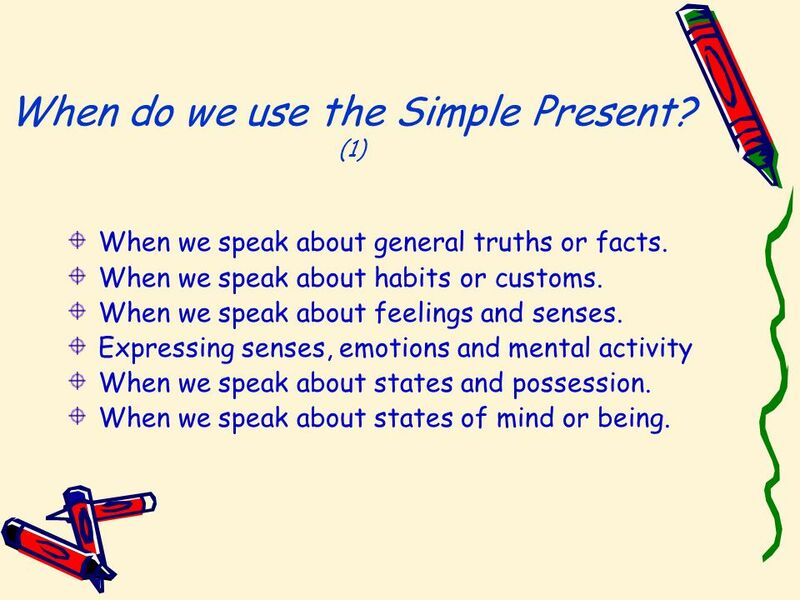 The present Simple…. * The present simple expresses daily habits or usual activities. * The present simple. It ‘ s always like this always on Mondays sometimes never often once a week usually every day. 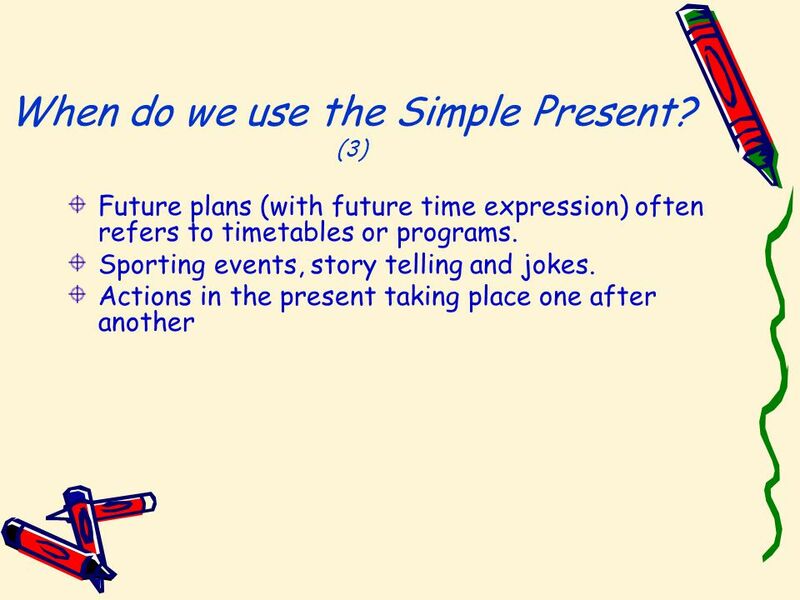 Present Simple What? When? How? Revision. Present Simple ? ? ? What? When? How? Revision. Read the dialogue and find the answers to the questions that follow. Q: Do you like the Israeli winter?